The big data market consists of infrastructure providers, data centers, data as a service providers, and other vendors. Solutions for managing unstructured data are evolving beyond systems aligned towards primarily human-generated data (such as social networking, messaging, and browsing habits) towards increasingly greater emphasis upon machine-generated data found across many industry verticals. For example, manufacturing and healthcare are anticipated to create massive amounts of data that may be rendered useful only through advanced analytics and various Artificial Intelligence (AI) technologies such as machine learning and cognitive computing. The long-term prospect for these technologies is that they will become embedded in many different other technologies and provide autonomous decision making on behalf of humans, both directly, and indirectly through many processes, products, and services. Emerging networks and systems such as IoT and edge computing will generate substantial amounts of unstructured data, which will present both technical challenges and market opportunities for operating companies and their vendors. Emerging big data tools such as open APIs much be implemented to facilitate data capture and processing with the ability to perform localized processing and decision making. Big data solution provider dynamics are evolving almost as much as the data management technologies themselves. While some companies rely upon proprietary solutions, many leading companies such as Hortonworks and Cloudera offer products and services primarily based on open source Apache Hadoop technology. One important distinction between market leaders is collaboration vs. competition. For example, Cloudera competes with IBM, Microsoft, and others in data science and AI whereas Hortonworks partners with these companies. In terms of data management and analytics technologies, the big data industry is experiencing profound changes across the entire stack including infrastructure, security, analytics, and the application layer. The data services industry as a whole is shifting from host-based network topologies to cloud-based, data-centric architectures, thereby creating enormous challenges and opportunities for transitioning and securing data systems. In concert with this shift, big data infrastructure will require strategic governance and framework for optimized security. Advanced analytics provide the ability to make raw data meaningful and useful as information for decision-making purposes. AI enhances the ability for big data analytics and IoT platforms to provide value to each of these market segments. The use of AI for decision making in IoT and data analytics will be crucial for efficient and effective decision making, especially in the area of streaming data and real-time analytics associated with edge computing networks. The ability to capture streaming data, determine valuable attributes, and make decisions in real-time will add an entirely new dimension to service logic. In many cases, the data itself, and actionable information will be the service. However, real-time data is anticipated to become a highly valuable aspect of all solutions as a determinant of user behavior, application effectiveness, and an identifier of new and enhanced mobile/wireless and/or IoT related apps and services. Augmented Reality (AR), Virtual Reality (VR), and Mixed Reality (MR) are perhaps best known as data-intensive immersive technologies that require high bandwidth for operations. One of the least evaluated opportunities is the market opportunities associated with visualizing data and information in AR, VR, and MR environments. Much of this data will be unstructured, requiring big data analytics tools to process, categorize, and display in a meaningful manner. This will allow the end user to visualize and utilize information in ways previously inconceivable. In addition, leading data management companies are developing tools for improved general data visualization, facilitating improved information interpretation and decision making. Coupled with AI and cognitive computing, the field of advanced data visualization and analytics known as augmented analytics is transforming otherwise useless data into highly valuable and actionable smart data, often enabling dynamic decision making that may positively impact business operations as processes, transactions, and other events occur. Much of this smart data will be monetized in a data as a service approach by enterprise thanks to leading big data service provider solutions. 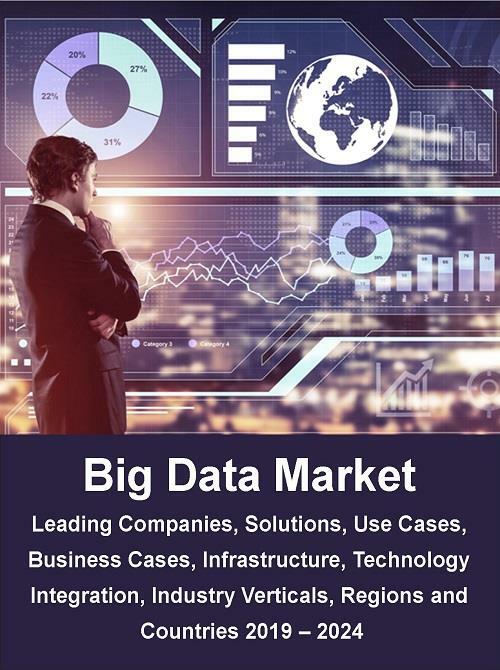 Big Data Market by Leading Companies, Solutions, Use Cases, Business Cases, Infrastructure, Technology Integration, Industry Verticals, Regions and Countries 2019 – 2024 provides an in-depth assessment of the global Big Data market, including business case issues/analysis, application use cases, vendor landscape, value chain analysis, and a quantitative assessment of the industry with forecasting from 2019 to 2024. This report also evaluates the components of Big Data infrastructure and security framework. This report also includes analysis and forecasts for streaming data analytics. IoT facilitates vast amounts of fast-moving data from sensors and devices. For many use cases, data flows constantly from the device or sensor to the network and sometimes back to the device. In some cases, these streams of data are simply stored (for potential later use) and in other cases, there is a need for real-time data processing and analytics.